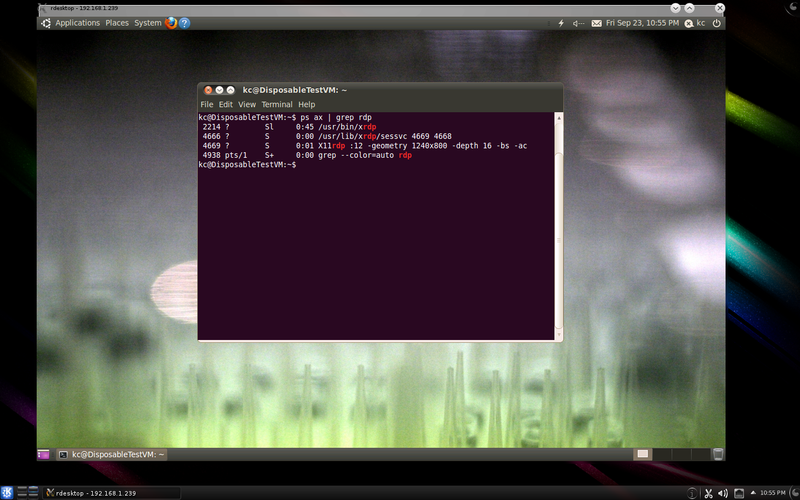 « X11rdp, Ubuntu 11.10, Gnome 3, xrdp customization – New Hotness! Updated! Note to Mark Shuttleworth – you may think Unity is the best thing since sliced bread, but I don’t want this anywhere NEAR my desktop system. My desktop is NOT a cellphone, or a tablet. So here’s how to customize Ubuntu to something more sane. In the Software Center’s search bar, type “gnome-shell”, and it’ll display the gnome-shell package for you. Click on that entry, and on the right hand side click on the Install button. Enter your password when prompted. When you’re back at the login screen, click on the gear icon next to your login name, now you have more choices for your login session; GNOME, GNOME Classic – with or without effects. Believe it or not, I kind of like the new Gnome Shell – it’s VASTLY better than Unity, on my desktop, and I’m kind of getting used to its new approach. And here’s the Gnome Classic option – a bit more like a traditional desktop environment. Let’s customize the Classic desktop a bit. I want to end up with just one panel, at the bottom of my screen, with all the menus and notifications there too. NOTE : Right-clicking on the panels does not work like it used to in Gnome 2.x . In Gnome 3.x , you also have to hold down the ALT button. Move the Menu bar from the top panel to the bottom by placing your mouse cursor over it, holding ALT and your MIDDLE mouse button, and drag it down. Same goes for every other item on the top bar. Finally, position your cursor over the top panel, hold down ALT and RIGHT mouse button, and click on Remove Panel. Yay top panel is gone, but eek! What’s this hiding behind it? Oh noes it’s the dreaded Global Menu! Hit return, enter your password, and let the system do the rest. After that , log out then back in again. No more menu at the top. The panel color can be changed too by ALT+RIGHT button clicking to bring up its menu, then click on Panel Properties where you have a General and a Background tab. Similarly, the Workspaces app on the panel can be modified to add more workspaces by ALT+RIGHT button clicking on it and setting the # of workspaces. Here’s a screenshot of my customized Gnome Classic desktop. Not so fast, Ubuntu! Hit Disable. Ubuntu also like to customize Firefox for you, which you can correct by disabling the two default extensions in the Mozilla add-ons Manager then restarting Firefox. Of course you can also install Chromium browser. To enable the Run Command prompt in Gnome Classic, go to Applications–>System Tools–>System Settings–>Keyboard , then click on the Shortcuts tab, click on System, click on “Disabled” next to where it says “Show the run command prompt“, and enter your preferred keyboard shortcut – which in my case is ALT+F2. Log out and back in and press ALT+F2 and voila. sudo apt-get install gnome-tweaks , then going to Applications–>Other–>Advanced Settings will enable you to easily change things like having the various useful “standard” icons on your desktop (like Home, Network, etc.) , change fonts, themes and lots more. Return Of The Classic Scroll Bars! To return to classic scroll bars on programs and utilities like firefox, terminal, etc, simply use from a terminal the command sudo apt-get remove overlay-scrollbar liboverlay-scrollbar3-0.2-0 liboverlay-scrollbar-0.2-0 , and again log out and back in again. I never liked the new scroll bars. My major problem (and the reason I will *NOT* be upgrading to Onanistic Ocelot) is that the nvidia driver and the Xorg setup don’t play nice with my 4-head desktop. This is the machine I do Real Work[tm] on, so it’s non-negotiable. I can live with everything else…I’m capable of tailoring away all the rest of the issues. In fairness, the problems with Xorg and the binary-only nvidia driver aren’t Ubuntu’s fault, so I’ll wait for 12.04 and see what happens. Thanks. That’s all very helpful and thorough. My desktop computer defaulted to classic gnome when I upgraded to 11.04 because it didn’t have enough graphics horsepower for Unity. I’m thankful for that. I’d like to upgrade my laptop, but I didn’t like Unity. It’s not a work environment. It’s more an entertainment environment. I’ve been waiting, and dreading an upgrade, because frankly, I don’t have the time to screw around with my computer trying to get it to be ‘just right’ again. Trying to fix a screwed up computer is for Windows users. I got away from that years ago when I upgraded to Ubuntu. Do you think that Canonical is paying attention to all the negative user experience noise that hangs like a cloud over Unity? I think Ubuntu has just one more chance, in its next iteration of the distro, to show that it has been listening. If it doesn’t at least give people a choice at install time of what kind of desktop experience they’d like ( “Please choose your preferred desktop experience: [ Kill it with fire! ] [ Hurrah! ] ” ), rather than making a horrible choice FOR the user by default, then I’m certain Ubuntu will get consigned to the history books. I’m still not understanding why Shuttleworth thinks Unity is any way better than even the Gnome Shell. I can understand the thinking behind gnome-shell, and it does grow on you after the initial shock of using it, if you’re used to old-skool desktop experiences. Unity, on the other hand, does everything gnome-shell does, except far, far worse. It’s the equivalent of reinventing the wheel such that their new wheel is triangular shaped – in other words it’s crap, and it gets in the way of what you want to get done. I tried Unity, I didn’t give up for 10 days, thinking I could get used, but it was a really awful experience. Then I found the way to install gnome shell (I was in early 11.04) and I tried it… And I’m liking it as more as I use it. I think it’s one of the best desktops I ever used, and I’m really missing it when doing RDP desktop on my server (not enough graphic power, I guess, and it’s difficult to manage effects over internet). On the other side, Unity seems to have taken all the worst of each desktop, first of all the global menu bar of Apple (really, ubuntu devel didn’t think that there must be some good reasons if *nobody* has copied that crap up to now ??). What to say more ? I was thinking to leave ubuntu, then I found gnome shell and I’m happy again with it… just some more work to set it up on my taste. And thank you for your suggestions on how to setup the RDP + Gnome-fallback, I was really missing it ! What a pain in the neck! I was just forced to upgrade because Ubuntu discontinued support for my older version, and now I'm stuck with a horrible bar on the desktop that I can't live with. I haven’t the time to do anything about it right now, but tomorrow I'm going to kill it with fire. Thanks for the article on how to do it. I’ve been persevering with Unity it looks good IMHO but is tedious to use. The global menu bar (very slow as continually switching windows back and forth just to get a menu up – try gimp for an example), tedious slow app switching (long delay to bring up a cached low res previews), fiddly resizing (selecting whatever is below half the time) and similar problems with scrollbars including default colouring that makes the full size ones almost invisible in firefox. Doing simple stuff is ok but anything vaguely complex and it trawls. For example I’m issuing twice as many mouse clicks and switching apps needlessly etc. etc. just to work with it. Even after a long period of adjustment to the interface I still find it painfully slow. Didn’t look like much had changed with 13.04 either, I was really expecting everything to be much more configurable by now too. I know! I know! You can turn it all off and change all the settings to make it more workable but ultimately if you have to do that out of the box how good is it? I’d just like to add that after reading something Linus posted about KDE I decided to give it another go. I used to use it a while back but found it rather buggy and slow. My impression now is completely different I would recommend anyone who doesn’t like Unity to give KDE a go. It’s highly configurable and there are a multitude of themes/plugins available for download directly within the settings. The application switching is far superior, just push the mouse into the top left corner (default setting) and get an instant preview of all the windows on your desktop (including minimized ones of course). Using it locally it seems stable to me and I think I will be going with this as my default desktop. I find I’m far more productive with this. Remote experience via xrdp seems ok although I saw no speed up with X11rdp over vnc at all. x2go did seem faster with a lot of apps but also caused some applications like dolphin to fail to start reliably. Both seem to cause problems with the applets which run fine locally, with xrdp I had to quit the network applet as it was spinning and eating CPU cycles. Noted that the eclipse menus under KDE worked a lot faster via x2go than in Unity, maybe because I hadn’t installed the GTK+ toolkit at the time. Also noted the xinerama extension in x2go gave a workable dual screen with KDE which seems to behave correctly unlike in unity where one of the menus is back to front and you have to click and hold for the global menu. Problem with x2go is that it seems to make things unstable sometimes e.g. tiny desktop in the top left, kwin crashes repeatedly and KDE recommends you start metacity as a fall back. Miscellaneous other problems with it too that made me think it wont be a good choice. Xrdp does seem to be a lot more stable with KDE and just about quick enough to be usable on a slow link. You can also setup fakexinerama if you need dual screen (or more) – probably the same results as with x2go except you have to manually configure your .fakexinerama screens.